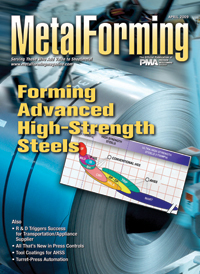 Higher-strength steels perform differently during forming than other grades. Find out how and why, and how to prepare tooling to meet these forming challenges. Research and development projects such as large-part PVD coating and high-velocity electromagnetic forming are game changers for American Trim as it looks to stay upfront with new technology on behalf of its transportation and appliance customers. Not up to speed on controls? That's not surprising, given how they've evolved in recent years. Read on for an update. A new CNC turret punch press with automated material handling partners with a new CNC servo-electric press brake to allow this manufacturer of tool-storage products--cabinets, drawers, etc.--to bring back inhouse all of its sheetmetal-fabrication services. Like your mom als said, put that coat on. And when considering a tool coating, keep in mind the many s that forming high-strength steel affects the decision.